Invisalign Dental Treatment in Commerce Twp Dental Office! Our Commerce Twp. dental office offers professional Invisalign® services to his patients. Invisalign® is a state-of-the-art alternative to braces, and is virtually undetectable. Invisalign® straightens your teeth, with a series of clear and customized removable aligners. There are no brackets or wires! Many of our Commerce patients agree that clear aligners are more convenient vs. traditional braces, because they are removable and not permanent. Our dental practice also offers many cosmetic options including braces and veneers. A complimentary consultation with Dr. Sedki in his Commerce Twp MI dental practice can identify if Invisalign® is right for you. How Do Invisalign® Aligners Work? Invisalign® works by straightening your teeth with a custom series of invisible aligners created for each patient. 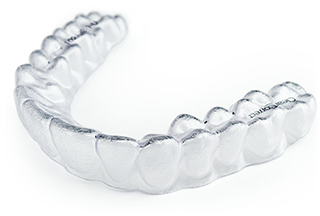 The clear aligners are similar to trays, which are comfortable to wear over your teeth. The process works by gradually shifting your teeth into place. The major advantage is the elimination of metal braces. Approximately every couple weeks, you get a new set of clear aligners, until your teeth are straight! Imagine getting the smile of your dreams, without the metal. Rest assured that Dr. Sedki works closely with his patients and monitors their progress during the treatment. 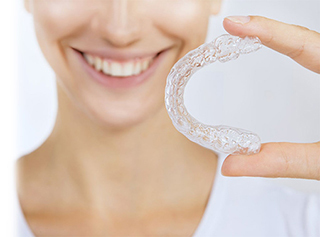 Invisalign® is the new standard in clear aligners and are the invisible way to straighten your teeth. The Invisalign® is a series of clear removable aligners used to straighten your teeth without metal wires or brackets. Dental visits occur about once every 6 weeks to ensure that your treatment is progressing as planned. You remove your clear aligners only to eat, drink, brush, and floss. Invisalign® has been proven effective in clinical research. Over 70% of all dentists are certified to treat patients with Invisalign®. Treatment time averages approx. 9-15 months. Typically, 18 – 30 aligners are worn during the treatment, but will vary from case to case. Your teeth move as you replace each aligner with the next. Week by week your teeth become straighter, ultimately reaching their final position prescribed by your dentist. Make sure to check out our other cosmetic dental advantages including clear correct aligners, veneers, and teeth whitening services. If you want to learn more about the invisible braces system, please visit the invisalign website here.